The A-1 Concrete Leveling's process for leveling concrete, sometimes called mudjacking, allows us to return uneven concrete to its original level position without the cost of pouring new concrete. At it's simplest form, we fill any void under your slab with a slurry mixture which in turn lifts the concrete in place. It is safe and effective for many applications and in most cases can be completed in a matter of hours instead of days for new concrete. Sidewalks, patios, pools, driveways, steps, porches, garage floors, and interior slabs. 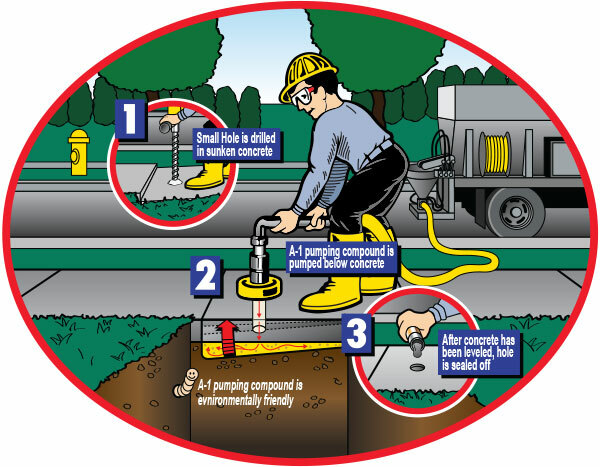 A-1 Concrete Leveling can save you up to 80% over the cost of tearing out and replacing your concrete.